Illuminate your world with Nebo Tools lighting products and tools. 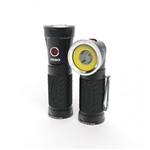 Hutch carries a large selection of Nebo Tools high-lumen flashing lights, head lights, and bug zapping bulbs. If you need the best equipment for your outdoor activities, Nebo and Hutch are here to help. This is the Big Larry Work Light Holster and it is specifically made to carry the Big Larry C-O-B Work Light. With the structural strength and durability that the hostler provides you can secure the protection of your Work Light. The holster is not only durable because of its rugged metal base but it is also convenient. The holster was designed to have a metal base insert that allows the Big Larry to attach magnetically, and with the large front clip the holster ensures your work light will not leave your hip, that way you will always have it by your side. The NEBO BITBRITE is a useful, and modern C-O-B task light that not only outputs a maximum 40 lumens of bright light, but also doubles as a screwdriver. Stored inside the Nebo BitBrite are 3 magnetic bits including a Phillips, Flat and Torx (T15) bit. The tool also comes equipped with a convenient steel pocket clip and also has a heavy-duty magnetic base for hands-free lighting. With the new C-O-B LED technology The Larry is now brighter than ever before. The Larry outputs 170 lumens of bright light. It comes equipped with a rotating magnetic clip that allows you to experience hands-free lighting by attaching the clip to almost anything. The Larry is made with a reinforced plastic body that is designed to be water and impact-resistant, making this light virtually indestructible. BPA Free & Dishwasher Safe LID. Spill & Leak Proof Lid. Nebo FlipIt is a C-O-B LED that can output 215 lumens. The FlipIt is designed to operate just like your standard household light switch, only with FlipIt you do not have to worry about the installation process. There are a total of 3 ways to attach your FlipIt: 2 loop and hook tabs, 2 magnets or 2 screw holes - which is for permanent mounting. Each package comes with 2 FlipIt portable LED Light Switches. The Poppy is a combination of a C-O-B LED lantern and a powerful LED spot light that can output a maximum of 300 lumen. The Poppy is a versatile product that is the perfect light for both indoor and outdoor use. The outside of the Poppy is rubberized with an impact-resistant element making it durable but also comfortable and easy to hold. The Poppy is designed to easily change from a spot light to a lantern by sliding its top up, which reveals the 360 degree C-O-B Lantern. The handle is designed to easily adjust to serve both light modes. If you have a problem with mosquitoes and other flying insects then the Z-BugBulb is a must have product. Not only great for outdoor use but also for indoor use if you find your home's interior overcome with flying insects. 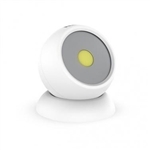 The Z-BugBulb puts out a bright, white, ambient light with 600 lumen LED. The 4 NUV LEDs put off a 395nm near ultraviolet glow, which flying insects find irresistable. Surrounding the NUV LEDs is a 1,000 -2,000V high voltage grid that kills the enticed insects on contact. The Z-BugBulb comes with a Sweeper to sweep off the insect remains from the grid housing. 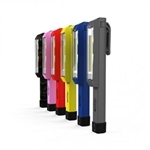 The RedLine OC is a powerful flashlight that outputs 550 lux of perfect white light. The 550 lux is not the only special part of this flashlight. The OC (optimized clarity) technology is what puts this flashlight above others. The OC Technology paired with the convex lens creates an optimized clarity that makes a perfectly dispersed beam of light while operating in flood mode. This piece of modern technology has the intensity of the 550 lux light yet it is still easy on the eyes which makes it an ideal flashlight. With the recent rise of insulated tumbler cups, like Nebo's own Tumbler, the Nebo Glow Light with Handle is the perfect accessory. The Nebo Glow Light with Handle fits securely around your 20 oz. or 30 oz. 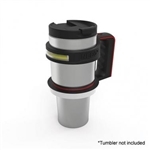 tumbler with its rubberized grip ring and the handle makes holding, carrying and drinking out of your tumbler easier. This handle also features a Glow Light which gives you the power of light with a push of a button. The Glow is able to fit most standard cup holders. 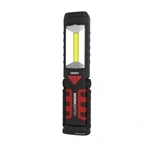 The WorkBite 2 is a very unique work light that has the ability to adapt your work environment. Every work environment is unique and different, having a work light that can adapt to these different environments becomes essential to work operations. This is why the WorkBrite 2 is such a handy work light. This work light comes with a C-O-B LED that outputs 200 lumen. The work light also features a 100 lumen flashlight and a rear, emergency red flasher LED. One of the best features the WorkBite 2 has to offer is its hands-free lighting options. It has 3 hands-free options: a hanging hook, a 200 degree pivoting and a magnetic base. With these 3 different hands-free options, this product can work for you no matter the application. This work light DOES IT ALL. With C-O-B LED technology that outputs 400 lumens, the Big Larry really knows how to light up a room. However, the Big Larry allows you to adjust the light's brightness, which is great for different environments. The work light also has secondary light modes with a low 160 lumens light and the Emergency Red Light Flash mode. This powerful red light is ideal for distress signaling or roadside emergencies. The Big Larry has an anodized aluminum body and recessed LED housing that makes this work light tough and ready to handle any situation. This is the Z-Bug Lantern + Light and is not only a powerful light and lantern, but is also the next line in insect defense. The Z-Bug Lantern and Light takes the Nebo Z-Bug Bulb and combines it with Nebo's Poppy Lantern and Spot Light to create the ultimate product. It is equipped with NUV LEDs which insects are naturally attracted to and a 360 degree bug-zapping electric grid. This special combo will keep your outdoor activities well lit and bug free! The Z-Bug Lantern and Light comes with a Sweeper to remove the remains of insects out of the electric grid. The Nebo Cryket was designed to be a versatile Work Light and Spot Light that comes equipped with a 9 Position Swivel Head. The Cryket is a 3 in 1 LED light that has a 240 lumen C-O-B work light, a powerful 250 lumen spot light and an intense red light. The unique swivel head is designed for the light to rotate into a forward-facing light, perfect for many different working conditions. The Cryket comes with a magnetic base that allows hands-free lighting. It is also equipped with a durable steel pocket clip. With a 9 position Swivel Head, the Big Cryket was designed to be a versatile work light and spot light. The Cryket is a 3 in 1 light, which features a 300 lumen spot light, a 300 lumen work light and a 30 lumen red light - perfect for distress signals and roadside emergencies. Its unique swivel head design allows the light to rotate down into a forward-facing light, great for various working conditions. 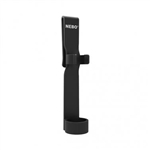 Comes with a durable steel clip and a magnetic base, perfect for hands-free lighting. The Rebel is a head lamp that has an adjustable head strap and is equipped with a fully rechargeable task light. Although this light is small enough to fit in the palm of your hand, it is also powerful enough to pack a punch with its impressive 600 lumen output. This powerful head lamp can also rotate, has a removable steel clip and a heavy-duty magnetic base to provide other hands-free options. The Redline Blast is an extremely powerful flashlight with 1,400 lumens of high intensity light. This flashlight can extend its bright beam over 260 meters making this a must-have flashlight. Not only is the Blast very effective, it is also heavy-duty and durable. This flashlight is COMPLETELY WATERPROOF and is ready for any type of weather condition. The Blast also has a 4x zoom and 5 different light modes, which includes: high, medium, low, defensive strobe and flashing beacon. This fully rechargeable flashlight offers a smart select dial, 4x adjustable beam and also acts as a power bank for your USB powered device.